Catalytic Reduction – High Pressure) portant milestone – to land a frst refer- which it can already reference more which can be arranged in a multi-setup product, as Mitsui (MES) ordered 3 × ence but we expect MAN SCR-HP sales than 650,000 operating hours. The MAN similar to turbochargers. SCR-HP (cluster 3) units in connec- to push on now as a result of this order,” SCR-HP is available for two-stroke The SCR-HP system consists of the re- tion with the building of three 87k-dwt said Ralph Klaunig, Vice President, engines of all bore sizes and reduces – actor – including mixing unit, urea injec- bulk carriers for the Ocean 21 Holdings MAN Energy Solutions. “Crucially, we through internal catalytic reaction – NOx tion lance, honeycombs and soot blow- company. Each bulker will be powered are now the only manufacturer capable exhaust emissions to IMO Tier III limits. ers – along with a module-based supply by a single MAN B&W 6S46ME-B8.5 of delivering both exhaust-gas after- With specially developed honeycombs system, as well as the reactor’s control low-speed engine delivering 9,900 kW treatment solutions: high-pressure selec- and honeycomb materials, as well as an unit that communicates with the engine- at 84 rpm, and aspirated by an MAN tive catalytic reduction, and exhaust-gas integrated mixing unit, the overall size of control system. TCA66 turbocharger. 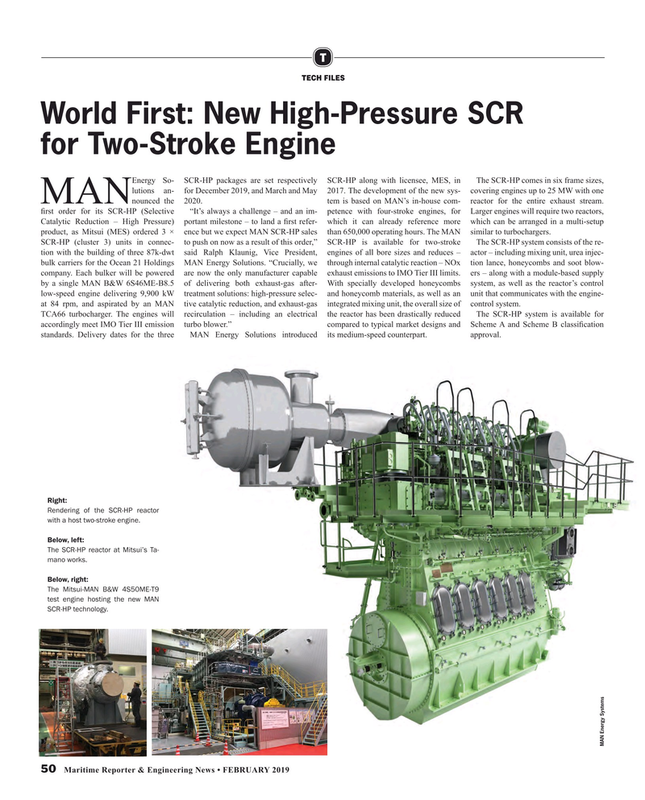 The engines will recirculation – including an electrical the reactor has been drastically reduced The SCR-HP system is available for accordingly meet IMO Tier III emission turbo blower.” compared to typical market designs and Scheme A and Scheme B classifcation standards. Delivery dates for the three MAN Energy Solutions introduced its medium-speed counterpart. approval. The SCR-HP reactor at Mitsui’s Ta- mano works.